One hundred and twenty five cases of clinically diagnosed allergic contact dermatitis were studied. All patients were subjected to patch test with standard test allergens and also with suspected test allergens based on history and clinical profile. 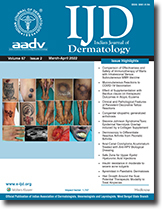 Allergic contact dermatitis due to Parthenium hysterophorus was commonest and found in 64% cases, followed by wearing apparel and jewellery in 16.8%, topical medicaments in 8% and cosmetics and occupational contactants in 5.6% cases each. The common individual allergens other than parthenium, were nickel in 8.8%, leather, hair dye and cement in 3.2% each, nitrofurazone and petrol, oil, lubricant (POL) in 2.4% each. Patch test with suspected allergens was positive in 72% of cases. A study on 400 patients of leprosy was carried out to assess the ocular involvement in different types of leprosy. It was seen that duration of leprosy is one of the important factors responsible for the severity of ocular involvement. Early diagnosis and proper care have been stressed. Arsenical calamity in West Bengal was first detected by the author from Dermatology out patients department of the School of Tropical Medicine Calcutta in 1982 from patients of Gangapur village of North 24 Paraganas, District of West Bengal. The diagnosis of chronic arsenicosis was confirmed by finding high arsenic (As) values in nail, hair and skin scales. Only two incidence of exogenous arsenicosis, one from surface soaks of Paris green factory and one case from homeopathic arsenic drug intake have been noticed. Most of the arsenicosis occurred from intake of ground water. More than 2,00,000 people in 1206 rural areas of 76 blocks of 9 districts of West Bengal have been found to be affected with arsenicosis. Two cases of actinomycotic mycetoma of the scalp caused by Actinomadura pelletierii are described with their classical clinical, mycological, histopathological and radiological features. The first case was treated with contrimoxazole as monotherapy. She developed recurrence later, even while on therapy. The second case was treated with combined oral cotrimoxazole and parenteral streptomycin with a good response. A case of plasma cell cheilitis with good response to glucocorticoids, is described for its rarity and probable aetiological correlation with habit of use of nasal snuff is discussed. Two cases of familial cutaneous collagenoma are presented for its rare occurrence. Histopathological report helped to establish the diagnosis. A family to type II hypercholesterolaemia is reported for the rare occurrence of Koebner phenomenon at the site of venepuncture and skin biopsy scar. A 42 year old male patient having reticulate acropigmentation of Kitamura is being reported for the first time from South India. A widespread granuloma annulare in a 42 year old female is reported. The lesions were large and annular with sharply defined raised beaded margins and involved the trunk and upper extremities. Lymphocytoma cutis, a type of pseudolymphoma, is a rare disorder with distinct clinical and histopathological features. A female patient presented with an asymptomatic, indolent dull erythematous, slowly progressive, firm nodular lesion of more than five years duration on right side of face diagnosed histopathologically as lymphocytoma cutis. The lesion showed no tendency to self- healing in more than five years duration and did not respond to chloroquin or to systemic and topical steroids. A 28 year old woman, presented with woody indurations of the skin over the buttocks with multiple, well defined punched out ulcers with a rim of hyper pigmentation surrounding them. She used to receive intramuscular pentazocine injections over her buttocks for recurrent abdominal pain. This is one of the few reports of pentazocine abuse resulting in cutaneous manifestations from India. A family consisting of a brother (11 years) and his twin sisters (13 years) with cerebrotendinous xanthomatosis is presented. The brother had bilateral achilles tendon xanthoma, low intelligence, poor memory with early cerebellar signs. The sisters had bilateral juvenile cataracts in addition to Achilles tendon xanthomas. The serum cholosterol level in all the three was within normal limits. The FNAC and histopathology of tendinous swelling showed touton giant cells and foam cells. A diagnosis of cerebro- tendinous xanthomatosis was made on the basis of Achilles tendon xanthomas, bilateral cataracts and normal serum cholesterol. Leg ulcers are frequently caused by venous insufficiency, arterial insufficiency, neuropathy, or a combination of these factors. Klinefelter syndrome in association with chronic leg ulcers have been reported earlier. We report a case of Klinefelter syndrome with non- healing ulcer. The diagnosis of the Klinefelter syndrome was confirmed by karyotyping.